Effective communication between horse and rider makes the difference between a first place ride in the show arena and a disqualification. If you cannot tell your horse effectively where you want him to go and how you want him to get there then you are nothing more than a passenger traveling on a 1000-pound animal with a mind of his own. Effective communication is being able to deliver an instruction, or cue, to your horse and have your horse behave in the appropriate manner. For example, if you pull the rein to the right, then your horse needs to turn right in response to the rein cue. If you pull the rein to the right and your horse stops or goes left, then you are not communicating effectively with your horse. When a horse and rider work well together and communicate effectively, they should give the impression of being a well-practiced team. Horses communicate mostly through body language. You must understand the meaning of your horse's behaviors and gestures if you want to be able to communicate effectively with him. For example, a horse who is pinning his ears flat back against his head is not happy. Pinned ears can be a sign of pain, anger or irritation. If your horse is pinning his ears when you work with him, then you must take a look at what you are doing and attempt to solve the problem that is causing your horse to pin his ears. 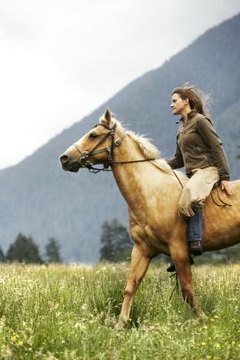 Communication between horses and humans requires patience and effort, especially if the horse is green or the rider is inexperienced. Learning to communicate with your horse involves a certain amount of trial and error. Working with a professional can help make communication easier. Riding lessons from a professional instructor can improve greatly a rider's ability to tell their horse effectively what to do when they are working on the ground or in the saddle. An experienced horse trainer can teach your young or green horse what to expect from humans and how he is supposed to respond to cues from his rider. It takes time to learn to communicate effectively with your horse. The more you ride and practice with your horse, the more effective your communication with him should be. Practice helps both of you learn what the other wants and needs to perform properly in the arena or on the trail.